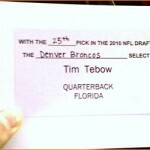 1 » Just before Mother’s Day, former Florida Gators quarterback Tim Tebow of the Denver Broncos spoke with the Denver Post about his mother, Pam Tebow, and how much she has meant to him throughout his entire life. “For 25 years, she’s pretty much put her life on hold for me and my siblings,” Tebow said. “She’s invested in our lives – we were her No. 1 priority, and nothing else really mattered. Now, she’s getting to do a lot of things she loves to do too with the speaking and the writing and the traveling. She loves it, though I still don’t think she loves it as much as she loved raising all her kids.” For much, much more, check out the Post’s story here. 2 » Shout out to Deadspin for this one. “Ten years ago, Darrin Henson was the Tom Emanski of instructional dance videos. He had one enthusiastic pupil, though,” and her name was Erin Andrews. The former Gators dazzler and current ESPN sideline reporter appears at the 0:45 mark of this pretty damn funny video.